Godzilla is a pretty iconic character - the first city-destroying monster that we think of when it comes to Kaiju. And as much as Pacific Rim did a lot to help renew Kaiju awareness in these oh so modern times. The whole Godzilla remake had totally slipped under the radar for me, so I was genuinely surprised when I first encountered a trailer for the movie a month or so ago. But I figured it was worth the gamble and one couldn't get much worse than the 1998 US remake of the franchise. So here was another US effort to reinterpret the Japanese classic film franchise. There are natural purist sentiments regarding Americans trying to make a Godzilla movie. He's pretty iconic to Japanese culture and it's hard to imagine a "proper" Godzilla moving being made by anyone else but the Japanese. And while this movie still had some great Kaiju elements, there were other aspects to it that sort of distracted us from the big finish - giant monsters fighting. 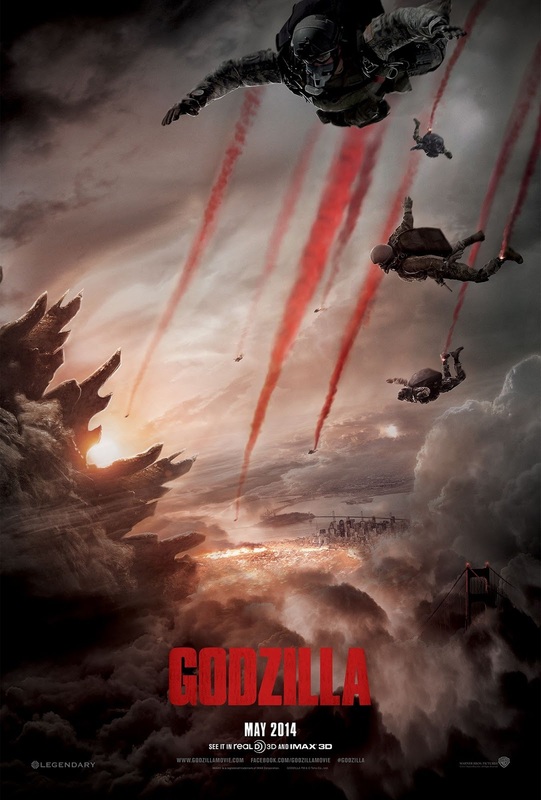 Synopsis: Godzilla is a 2014 American remake of the classic Japanese movie franchise. This latest version was directed by Gareth Edwards with a screenplay by Max Borenstein. In 1999 a mining operation in the Philippines calls in scientists Ishiro Serizawa (Ken Watanabe) and Vivienne Graham (Sally Hawkins) are called to investigate. Underground the crew had accidentally unearthed a massive cavern that contained the skeleton of some massive creature and two pods that appear to be eggs of some kind. However one of the eggs has hatched and something massive has escaped into the sea. Later on in Japan, a massive earthquake takes out an entire nuclear plant, killing the wife of the plant supervisor Joe Brody (Bryan Cranston). 15 years later, Ford Brody (Aaron Taylor-Johnson), Joe's son, is on leave from his last tour as an explosive ordinance disposal officer. He receives a call from the US consulate in Japan given his father has been arrested for trying to get into the quarantine area around the nuclear plant and Joe needs to travel to Japan to get him. But once there, he finds out that his father is still obsessed with proving that it wasn't just an earthquake that killed his wife. But at the same time, he suspects that whatever did take out the plant was due to come back given seismic patterns being observed now matched the event back 15 year ago. As you can see from my two paragraph synopsis, there's a lot of human sub-plot in this movie. And while I understand the need to have a human perspective as part of the story, there's a lot going on here. We have the whole Brody clan (including Ford's wife and son) and a number of members of the US Navy, and other military folks. I can appreciate the goal to have some degree of build-up before we encounter the giant monsters, but things get a little silly at times. Then there's the sound treatment, which at times works but more often than not was a little weird. I sort of appreciated the goal to show things from the perspective of the different characters and somehow convey the shock over seeing such giant creatures by muting the sound a little and focusing on the sound of the guy's breathing or something. But that sort of worked in the beginning - as the movie progressed we really needed to not just see but also hear these monsters. And seriously, these were some of the most silent Kaiju in existence. The monster fights were pretty awesome - they had some pretty good slug fests and when the monsters did get around to it, things got intense enough to merit some whoops from the cinema crowd. There were some clever ideas in terms of how they wanted these different monsters to battle it out. And yes, I totally went nuts about the light-up Godzilla blast moment - you know what I'm talking about. That really made things go crazy fun. But that's our usual problem in these sorts of movies - the story about the human condition really ends up slugging it out with the giant monsters fighting side. Sure, I enjoyed the esteemed Ken Watanabe's acting career distilled down to his ability to say" Gojira" while looking all dramatic along with "Let them fight!" but that wasn't enough to deal with all the blank stares from the Ford Brody and all the ridiculous decisions made by the military. I think we had he same challenge with Edwards earlier work, Monsters that had some good build up and great monster moments but a lot of dragging human bits in-between. As a popcorn movie, people expect to just see giant monsters fighting. I wanted more of Godzilla being all king of monsters versus those two Cloverfield rejects. I don't see why we had to watch the first fight as part of the most well-orchestrated news broadcasts ever. I do not watch movies like this to learn something new about the human condition or something silly like that. And while I'm impressed with the many different ways they directed Ken Watanabe to stare off into the distance, I need more to go on to make the movie that much more serious. Otherwise, just give me monsters. Godzilla is a fun enough movie - you just need to get past the first hour and enjoy the massive monster slug fest at the end of things. It's decent enough, but it's not quite full-on Godzilla celebration I was hoping for. The movie gets 3 strange EMP slaps by the MUTO out of a possible 5.